There’s nothing like the first day of a long holiday weekend. With a glass of wine in hand, notifications set to silent, and your feet up on the sofa, doing sweet nothing has never felt better. That is, until day two rolls around and the inevitable boredom of relaxing at home officially sets in. At some point over the holidays, we all reach that moment when we subconsciously start praying for a pipe to break just so we have something to do. Know that you are not alone. As inherently creative people, interior designers know this struggle all too well. Which is why we asked a few of our favorite designers how they stay sane when the fatigue kicks in. From cleaning the curtains to wallpapering the powder room, they’re all for tackling simple decor swaps and small home projects on a dreary winter day—in fact, they actually look forward to it. Stop twiddling your thumbs: Tackle these simple, designer-approved DIYs instead! Want something seasonal and crafty? When it comes to holiday florals, eucalyptus is proving to be a chic and breezy alternative to heavy evergreens. “A really easy and quick DIY I plan to tackle this season is a eucalyptus wall hanging. The simplicity is beautiful and it will double as seasonal holiday decor,” shares Natalie Myers of Veneer Designs. If you really have time on your hands and are looking for an impactful project to take on, designer Robin Wilson has mastered the art of the budget kitchen remodel. Seriously, she recently pulled off her own kitchen refresh in five days for $800! “We removed a 1970’s ceramic tile and replaced with a grey glass tile that will reflect light from the undermount LED lights that will be installed after Thanksgiving! [We] had some friends over already and got a lot of compliments. They think I redid the whole kitchen…” she tells Domino. “My favorite thing to do when we have down time during the holidays is to pick up and reorganize from the chaos of the season. Never underestimate the power of a label maker and reorganizing the pantry with cute gold and white labels! It’s an instant pick me up with little effort!” says Ashley Rose of the DIY blog, Sugar & Cloth. Wallpapering an entire room is not simple feat. But if you’re working with a space as tiny as Joy Moyler’s 84-square-foot bathroom, the task doesn’t seem so daunting. “One of our favorite projects this year was creating our own custom lampshade. Changing out a plain white shade not only updates the look of an old lamp, but it can transform the aesthetic of an entire room,” says Stephanie Andrews of Balance Design. Total DIY time? One hour. Get the full tutorial for this same project at I Like That Lamp. Forget spring cleaning, save yourself the headache by getting some chores done now. “I am looking forward to taking the time to washing all of our curtains—including the shower curtain!” says Joanna Hawley of Jojotastic. While it’s easy to forget about drapery once they’re up, curtains accumulate dust and stains over time. Your living room will thank you for doing an extra laundry load later! Denver-based interior stylist and designer Elizabeth Bear is all for a simple dining table swap that wall last past the holidays. Her essentials? A quality roll of children’s easel paper to drape down the table like a runner, a wood cutting as a centerpiece to stage flowers and candles, mixed greenery with paper magnolias, and cut-out letter place cards. “If it’s a festive party and you want that little extra something, it’s fun to buy a dozen or more helium balloons all in the same color with the same color ribbon and let them float to the dining room ceiling. I ask them to leave the ribbons uncurled so I can cut and curl them at home to be above everyone’s head when sitting,” says Bear. Brooklyn-based interior designer, Lauren Wills, is on the same page as Murphy when it comes to switching up the closet. 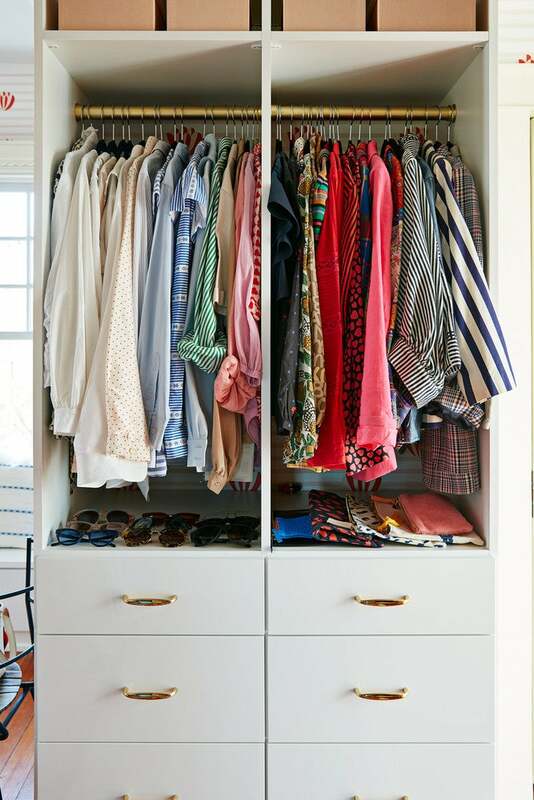 If you don’t have time for a decorative overhaul, consider sticking to a simple clothing purge! “Brooklyn has its space limitations, and nothing feels better than gaining some space between hangers in my closet,” says Wills. Prop stylist Heather Bullard is also looking forward to a major pair down this winter. Her goal? Clear her prop closet, clothes closet, and kitchen drawers and cabinets of clutter. “It always helps me embrace the whole “clean slate/fresh start” come Jan 1st and sets me on a path of intentional buying for the year ahead,” she says.